Get the basics! Counted Cross stitch is one of the easiest forms of stitching – Warning! It is highly addictive! Separate your Thread – DMC Mouline Stranded Thread is composed of six strands that are twisted together and easy to separate. Many cross stitch designs stitched on 14 – count Aida call for only two strands of thread, so you will need to separate your thread. Refer to your design chart to see how many strands (or plies) of thread the design specifies. Find the end of the thread on your skein of DMC Thread. Slowly pull the end out from the skein until you have a 50cm (18”) length of thread and cut it off. 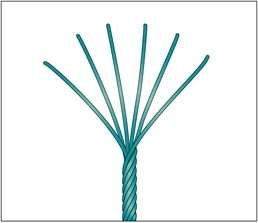 To separate the thread into individual strands, pull one strand up and out slowly until it is completely separated from the remaining strands. Continue to pull out the number of strands you need to stitch with. To rejoin the threads, hold them together at one end then gently pass your hand over the lengths of thread to smooth and recombine them. Prepare Fabric – To know when to begin a cross stitch design, it is helpful to find the centre of your fabric. Fold your fabric in half and then in half again, where the two folds intersect is the middle point. Place your fabric into an embroidery hoop. Click here for instructions on using an embroidery hoop. 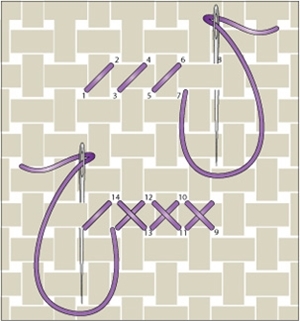 Thread your needle – Follow this handy needle threading guide to thread your needle with the DMC Needle Threader. Reading the Design Chart – Your design chart contains all the information you need to stitch your design. A thread colour key shows the symbols that correspond to each colour. The squares on the design chart correspond to the squares on the fabric. Every square on the design chart that requires a stitch will contain a symbol. It is important that you centre your design. Follow the four arrows on the design, where they all intersect is the centre point. It is easiest to start stitching from the centre of the design, but choose a section where you feel most comfortable. 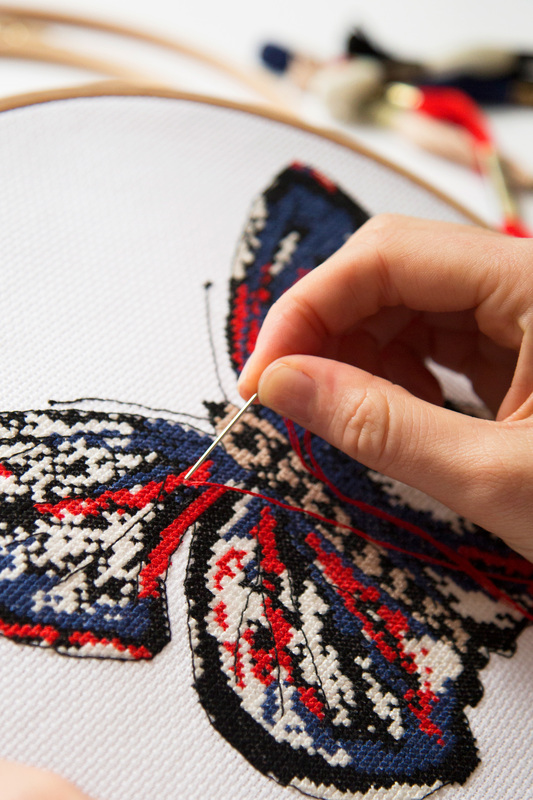 The most common stitch on your chart is the cross stitch. 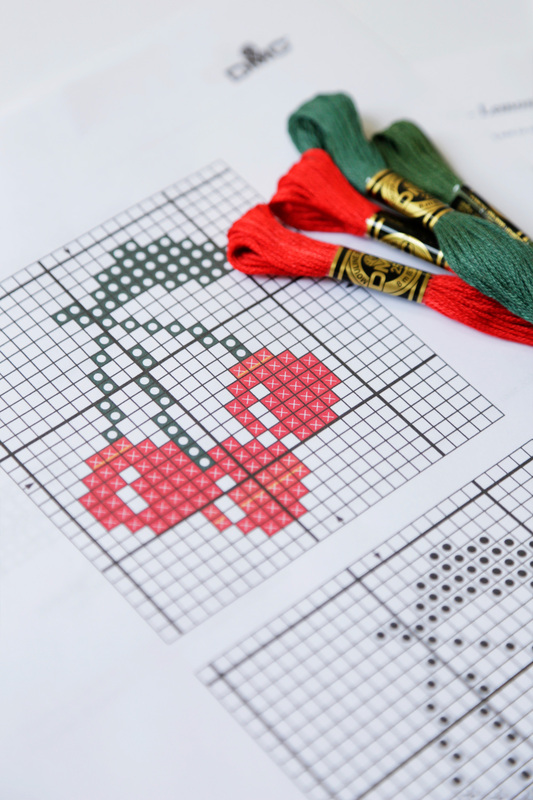 Where the square on your Design Chart contains a symbol taking up the full square, a full cross stitch is required. The second most common stitch is the backstitch. Backstitches are generally used as outlining or lettering. When a square contains a straight line or dotted line that join two corners, a backstitch is required. Less common stitches are half stitches, quarter stitches and three quarter stitches, also referred to as fractional stitches. Start stitching by pulling the threaded needle up onto the front side of the fabric, leaving a 2.5cm (1”) end of thread on the back. Hold the end of thread against the back of the fabric in the direction you plan to stitch and work the first 4 to 5 stitches over it to secure it into place. Be sure to check the back to confirm that your stitches are covering the thread and clip any loose ends before continuing to stitch. To end a thread, run your threaded needle under the last few stitches on the back of the Aida, then clip off the end of the thread. After you re-thread the needle to continue, simply run the needle under several stitches on the back to secure the thread and resume stitching. Quick Tip: When stitching make sure your thread lies flat, if your thread becomes twisted while stitching, drop the needle and allow the needle to hang freely. The thread will untwist by itself. Cross stitch is usually worked in horizontal rows from left to right. To make a cross stitch bring the needle up at point 1, lower left hole of one square of the fabric and down at point 2 upper right hole of one square of the fabric. Then up at 3 down at 4, up at 5 down at 6. Complete the row. To complete your cross stitches The return row is stitched right to left, make crosses by bringing the needle up at 9 and down at 10, up at 11 down at 12. Complete the return row and repeat the stitching sequence until the area is stitched as charted. For more information on how to stitch the cross stitch click here.